Beats by Dr. Dre Pill review | What Hi-Fi? Beats by Dre’s audio products are usually big on bass. Really big. The Beats Executive headphones are a good example. So imagine our surprise when we turned the Beats Pill wireless speaker on, and it sounded thin. Really thin. There’s very little deep, weighty, solid bass to be heard. The sound coming out of the Beats Pill speaker is lightweight and rather wispy, and lacks the big, punchy sonic character that we’ve heard so many times through Beats by Dre headphones. We have to admit - we’re disappointed by the weak performance. The sound is treble-heavy, but it isn’t particularly articulate or smooth. Stream David Bowie’s Ziggy Stardust over Bluetooth, and the high-frequencies sound rather coarse when pushed too hard. The Pill struggles when the volume is cranked up too: it doesn’t go too loud, for one thing, and the soundfield is rather restrained and congested. Voices sound weak and lacklustre. Even Gotye’s delicate vocals on Somebody That I Used To Know lack emotion and subtlety, and instruments don’t sound nearly tangible or cohesive enough to deliver true excitement. The Pill doesn’t dig too far into detail either, instead simply skimming the surface of songs. We wish it would scoop out some more subtlety, bass and better dynamics. On the plus side, it has decent rhythmic ability, zipping through tracks with agility thanks to its light sound. It does fare better when you play songs with a catchy, bass-heavy tempo. Justin Timberlake’s Rock Your Body livens up the Pill with more confident rhythm, as does Beyoncé’s Single Ladies (Put a Ring on It). Beats is known for its bold designs, and the cylindrical Pill is certainly eye-catching. It does look exactly like an oversized pill. We’ve seen our fair share of compact Bluetooth speakers, but the cylindrical shape here makes it seem particularly small when we pick it up. It does go some way towards explaining why we don’t get deep bass, but the Pill sounds thin even after taking that into account. It does strike a good balance, though, between being light enough to carry around, and having a sturdy build quality. The rubberised casing is smooth to touch, and you can clearly see the four drivers peeking out from behind the speaker grille. The large ‘b’ Beats logo in the middle is the Bluetooth pairing button, and glows a striking red when turned on. A small white LED at the back flashes in pairing mode, going steady when a connection is made. You can also connect using NFC - simply tap your NFC-enabled smartphone or tablet to the marked tag. Connecting either way takes mere seconds. The volume controls in the middle are discreet and responsive, but you do have to press the power button just a bit too hard for the speaker to turn on. We like the black finish of our review sample, but the Pill is available in six other bright colours. Take your pick from red, white, grey, pink and two ‘Pretty Pink’ finishes with blue and red accents. 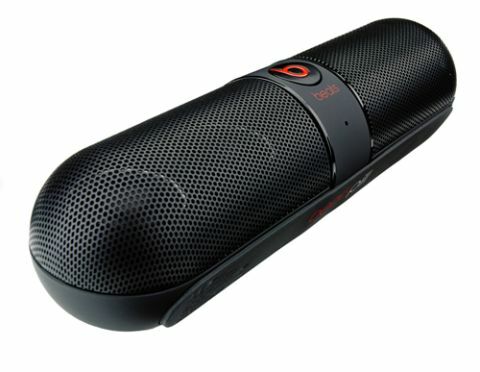 A 3.5mm input is standard on most wireless speakers, but the Beats Pill also offers a line out to connect to other speaker systems, or to plug in headphones. A 3.5mm-to-3.5mm cable is helpfully included in the box. The Pill does sound a touch more solid and intimate through headphones, but of course that could be simply because the sound is closer to your ears. It doesn’t change the overall balance, though, which still sounds on the thin side. There’s just seven hours of juice on offer, which seems rather paltry compared to some rivals that offer twice as long or even more. Make sure the Pill is on full charge before going portable, or keep the USB cable close by to charge via your laptop or computer. A mains adapter is also included, along with a carry pouch and carabiner clip. A mic is built into the Pill so you can use it as a speakerphone when getting calls from your connected smartphone. The red ‘b’ button controls the taking (quick press) or ignoring (long press) of calls, while a double press lets you switch between the phone’s speaker and the Pill. If you’re after that characteristic bold and bass-tastic Beats sound, you’ll be disappointed with the Pill. It’s pricey, too: we expect a much more engaging and articulate listen for £170. The Pill simply doesn’t have the sonic talents to match its class rivals, such as the Bose SoundLink Mini. At this price, it’s a tough thing to swallow.